Tunisia were moments away from snatching a huge point against England on Monday evening. But, their hopes were smashed by Harry Kane whose second goal of the game sealed the deal for the Three Lions. The team led by Nabil Maaloul now needs an upset against one of the main contenders for the crown, Belgium, in order to keep hopes of progressing from the Group G.
Belgium made it five subsequent wins in the group phase of the World Cup on Monday when they eased past Panama 3-0 in Sochi. Romelu Lukaku stole the show bagging a brace after Dries Mertens of Napoli broke the deadlock right after the break. Tunisia showed two two different faces of themselves against the Three Lions. But they have little hope here after their winless run stretched to 12 games at the World Cup. Belgium struggled badly to break the deadlock past arguably the weakest side in the competition. The Red Devils could just not find the back of the net in the first half of the clash with Panama. Their fans were nervous knowing that the likes of Argentina and Brazil drew with their respective rivals earlier on. Nevertheless, it was a spectacular volley strike from Napoli’s Dries Mertens which launched Belgium towards the victory right after the break. Romelu Lukaku then completed the job with a brace, assisted by the likes of Kevin De Bruyne and Eden Hazard apiece. Roberto Martinez’s men thus sit at the very top of the standings in the Group G. A victory over the African outfit will seal their berth in the knockout round of the competition. Besides, Belgium have done well in group phases at World Cups. The 3-0 victory over Panama was fifth on the bounce for the team at this stage of the competition. Furthermore, they are undefeated in last ten group phase games at World Cups. The streak is likely to continue on Saturday knowing Tunisia are winless in last 12 World Cup affairs, losing 8. England’s pace bewildered the Eagles of Carthage in the opening minutes of the first match. And it was a real miracle they held it to a 1-1 draw before the break. Still, they had a positive second half as they kept the ball and absorbed England’s pressure. It was a stoppage-time winner from Harry Kane that denied the North African a crucial point. Maaloul has reasons to worry, mainly a poor defense ahead of the clash with the star-studded attacking line of Belgium’s here. It was a successful afternoon for Roberto Martinez on Monday as his men clinched a comprehensive victory without an injury for any of his players. It was a rather nervous affair, though, as three Belgians surprisingly got booked (Meunier, De Bruyne and Vertonghen). There should not be significant changes to the squad that started against Panama. All eyes will be on Romelu Lukaku who will be looking to add to his fine two-goal tally here. Maaloul’s main concern is regarded to the goalkeeper position as his first-choice Mouez Hassen finished the tournament through an injury. 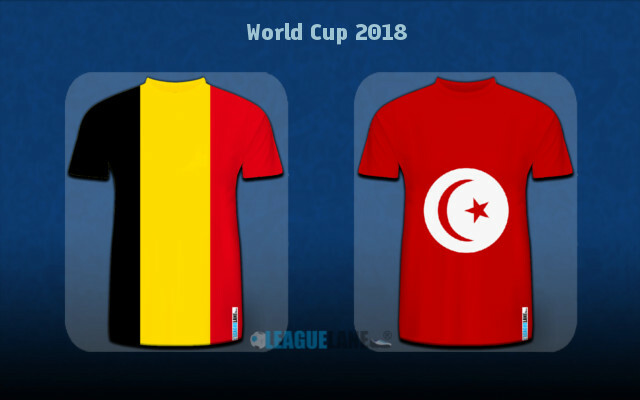 Farouk Ben Mustapha will thus start the second round clash with Belgium. 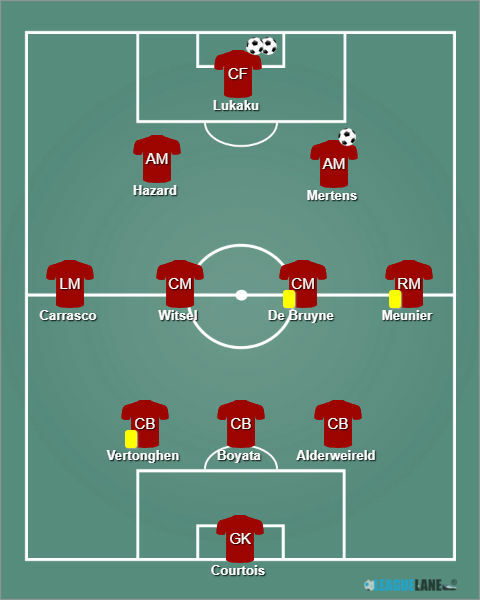 Other than this, we don’t expect changes to the 4-1-4-1 formation, just the one that Belgium have already faced against Panama on the opening day. 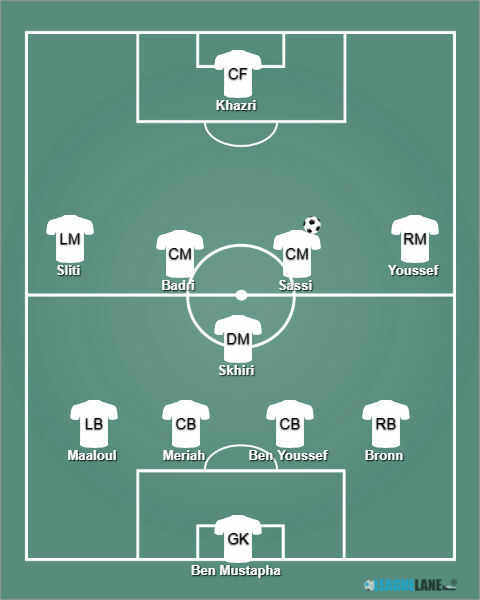 Tunisia’s right flank is a much stronger part of the team as the full-back Dylan Bronn and winger Fakhreddine Ben Youssef were the highest-rated players of the team in the first game against the Three Lions. Ben Mustapha – Bronn, Syam Ben Youssef, Meriah, Maaloul – Skhiri – Fakhreddine Ben Youssef, Sassi, Badri, Sliti – Khazri. Teams have a win, a draw and a loss each ahead of their fourth head to head meeting. Their first encounter happened back in 1992 when the Lions of Carthage took a 2-1 victory in a friendly. Teams shared spoils in their most important head to head clash which came at the World Cup 2002 in Korea/Japan. The group phase affair ended in a 1-1 draw. Finally, they met each other in another friendly four years ago when Belgium saw off their rivals 1-0 during the preparations for the tournament in Brazil. A lot will depend on Tunisia’s defensive reactions here. Maaloul’s troops offered two completely different showings against England. They could have easily conceded 5+ goals within the opening 45 minutes on Monday, while they should have kept their net untouched in the second half. The Eagles did nothing to challenge English defensive line on the day, though. The penalty-kick from Ferjani Sassi was their lone shot on target in the entire affair and we feel they would have never scored had the referee ignored the sloppy reaction from Kyle Walker who elbowed his rival inside the box. Belgium continued to be tough to break down against Panama, making it just one goal shipped in last six games if we count international friendlies. Belgium’s clean sheet is paid at the 1.66 odds and we’ll back it as the main betting option here. The value is also decent with Belgium to win by two or more goals, a bet priced up at the 1.95 odds. Predicted Full-Time Result is a confident victory for Belgium who should be in control from the get go. Belgium to keep a clean sheet @ 1.66. Belgium -1.5 handicap @ 1.95. Correct FT Score: 3-0 Belgium @ 8.50.
it’s actually “The Eagles of Carthage”, not “The Lions of Carthage”…this is the second article you’ve named Tunisia wrong.